Antique Map of the Southern Continent titled ‘A Complete Map of the Southern Continent Surveyed by Capt. Abel Tasman & Depicted by Order of the East India Company in Holland in the Stadt House at Amsterdam’. This first, large scale English map solely devoted to Australia shows the results of Abel Tasman’sfamous voyages in 1642-1644. 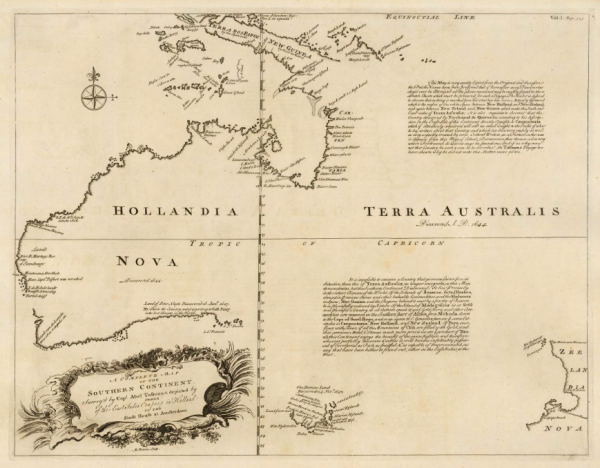 Based on the first published map of Australia by Melchissedec Thevenot, first issued in 1663, with the addition of the Tropic of Capricorn, as well as several other decorative elements, including: an elegant title cartouche, a compass rose and two panels of text. 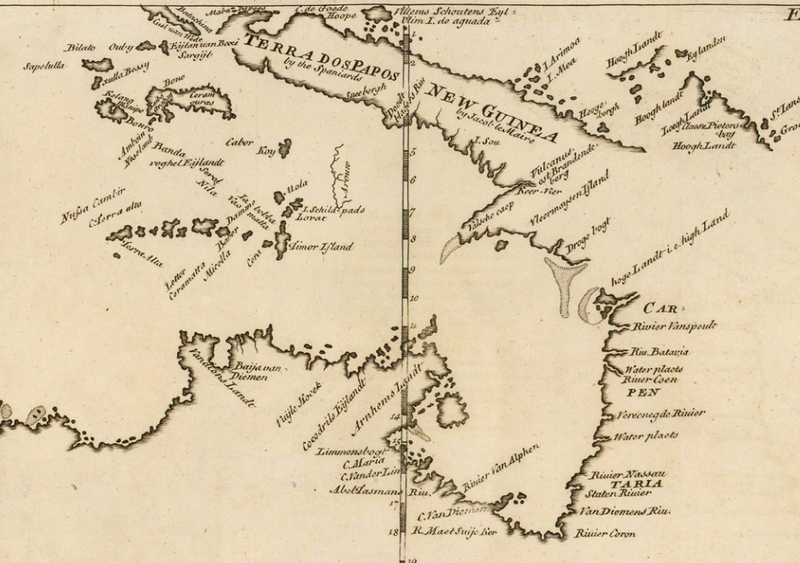 The lower panel of text states ‘it is impossible to conceive a country that promises fairer from this situation than this of TERRA AUSTRALIS no longer incognita as this map demonstrates, but this Southern Continent Discovered‘. Bowen incorrectly states on the map that the continent was discovered in 1644. Abel Janszoon Tasman (1603?-1659), mariner, was born at Lutjegast, near Groningen, in the Netherlands. In 1642 he was “appointed to command two ships to explore southern and eastern waters. Sailing in August he discovered Van Diemen’s Land, New Zealand, the Tonga Islands and some of the Fiji group, and re-explored part of the north coast of New Guinea. On his return to Batavia in June 1643 he was chosen to take part in an expedition to form a settlement in the Tonga Islands from which the Chilean coast was to be raided; while this expedition was preparing, he was ordered to find whether there was a passage into the South Sea between Carpentaria and De Witt’s Land. 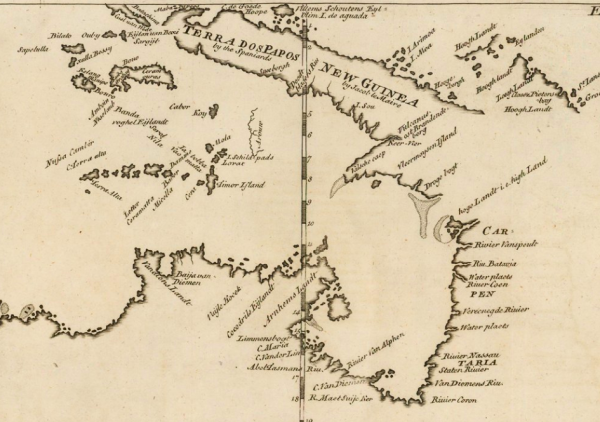 For this purpose he set out with three vessels at the end of January 1644 and, following the coasts from Cape Valsche round to Cape Cloates, satisfied himself that, except perhaps at Endeavour Strait, there was no passage. He was rewarded after his return in August 1644 by confirmation in the grade of commandeur, with a substantial increase in pay dated back to the beginning of his voyage in 1642” (J. W. Forsyth for the Australian Dictionary of Biography). Ref: Martin Woods for “Mapping our World: Terra Incognita to Australia”, National Library of Australia, page 143. / Hill 775; Sabin 30483. Catalogued by Kate Hunter. Measures: 720 mm x 830 mm.